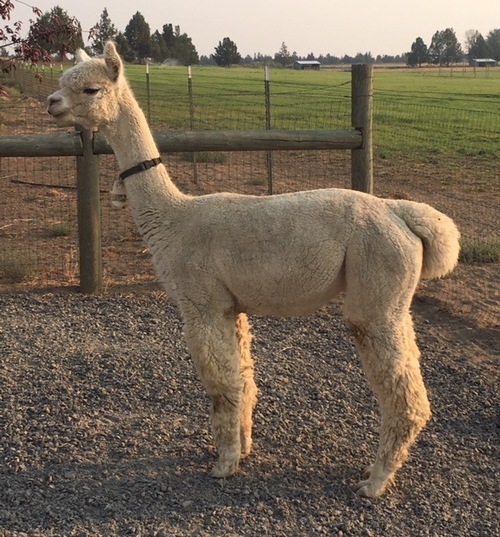 This "Beautifully Stated" female is part of our foundation herd and we are looking forward to years of awesome crias from her. She is a gorgeous medium fawn with impeccable fleece, great density, perfect conformation. She is a "package". What a GORGEOUS fleece on this female! Beautiful white, uniform, fine, incredible architecture, staple! She is beautiful!!! Want to get into white or add another lovely white fleeced female? Here is your girl! Lily's Fiber stats are very nice! 3.4 SD on her 2018 shearing with 19.34 AFD. CF is 99%! Lily's sire is FIA Excello's Rocky Bay (an Elite Maximus grandson). 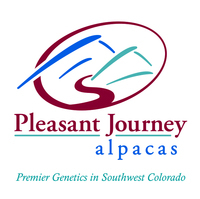 Her dam is of Royal Fawn and 6Peruvian Accoyo Titan heritage. Wonderful genetics! Princess Lily of PJA has a very bright future!!! 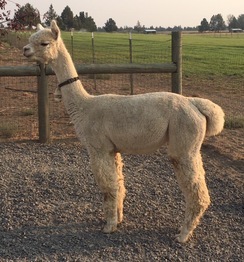 Lily has been confirmed pregnant to FDA Rembrandt of El Nino for a summer 2019 cria! First Place GWAS 2017 Walking fleece (Class of 12, yes 12!!!) - Sharon Loner- Score of 69.5 out of possible 75. Her score for Fineness/handle was 19.5 our of 20! 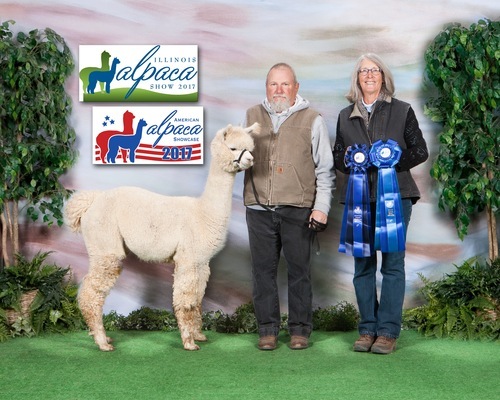 Judge commented on such a wonderful fleece on Lily and congratulated us on our program! 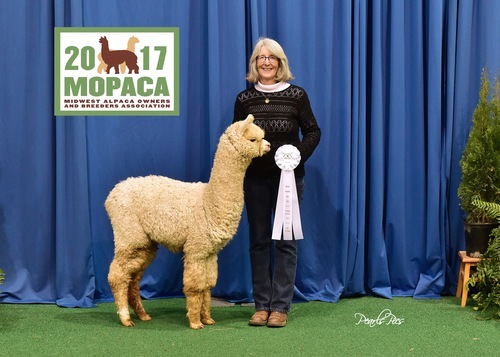 First Place 2017American Alpaca Showcase (class of 4) - Helen Testa Extremely fine, extremely dense, Great architecture base to tip. Fourth Place 2017 ABR Fall Fest Halter - class of 6 - Sharon Loner.